Did you catch my unconventional ingredient in there? I used Yellow Cake mix. 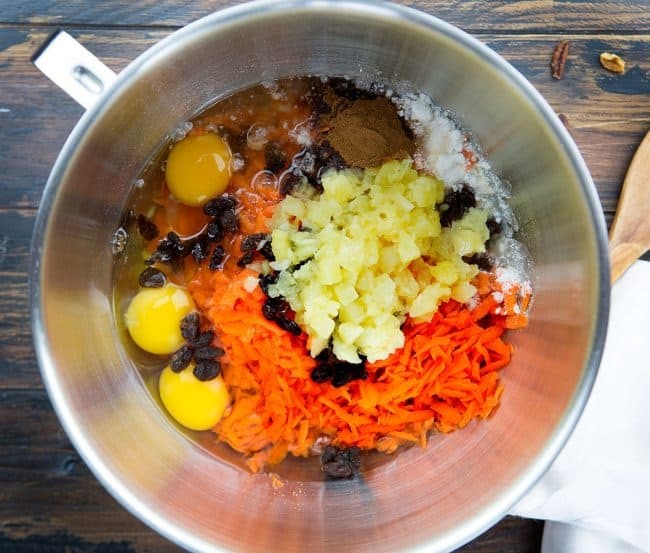 Why not use carrot cake? 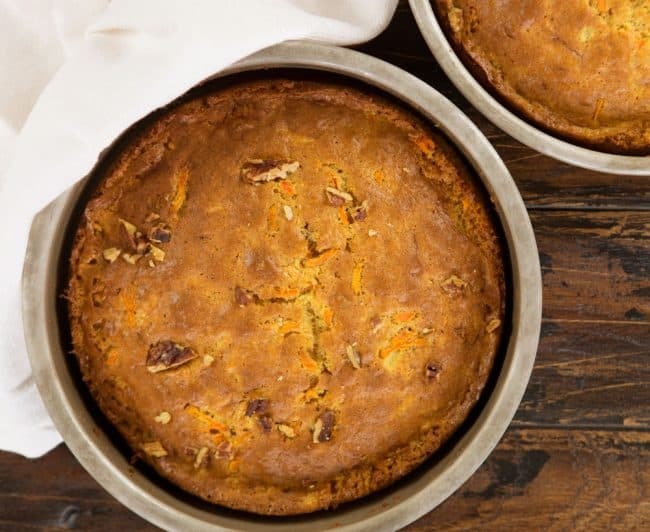 Well, the yellow cake mix adds a buttery richness that boxed carrot cake just can’t replicate. On top of that, I love that I can control the spice and the amounts of nuts, carrots, raisins, etc. This recipe can be perfectly adapted to individuals’ tastes and not all recipes can offer that! Don’t worry though, we will get those amazing spices in there! Just look at the gorgeous cake. I had a hard time getting a fork out and digging right in! The next best part of this recipe? I have seen versions of this frosting online but have never tried it because I pipe out 99% of my frostings. With the addition of brown sugar, I knew it would never get as stiff as I prefer for piping, so I stick to my traditional recipe. The beauty of this cake was that I could offer a “rustic” design and spread this glorious frosting out with no intention of piping. I am so glad I did! The rich depth of flavor when paired with this cake in like nothing I have ever tried. 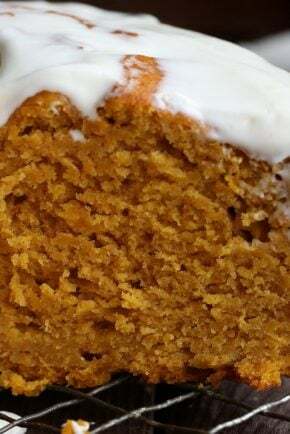 Save this Brown Sugar Cream Cheese recipe for the next time you make any carrot or spice cake! 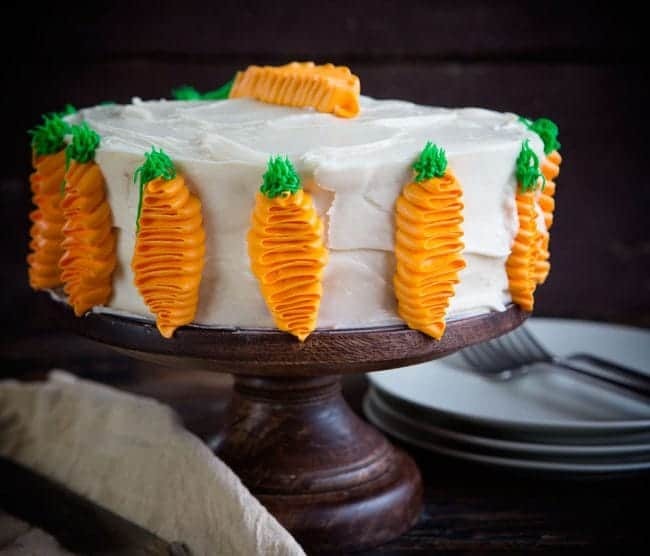 To make the carrots on the side of the cake I made up a 1/2 batch of traditional whipped buttercream. I tinted 1 cup green and the rest orange. 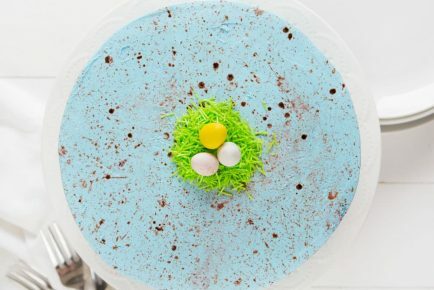 Put the green frosting in a pastry bag fitted with a #233 tip, or a “grass tip”. 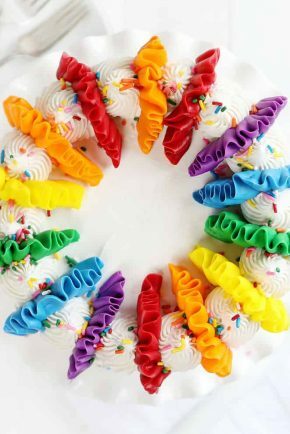 Put the orange frosting in a pastry bag fitted with a #104 tip. (this is a tear drop shaped tip) Using your orange frosting and with the small end of the tip facing away from the cake, start piping with a small back and forth motion against the bottom edge of the cake. Slowly move up and make the back and forth motion a little wider as you move up. Taper it in toward the top of the carrot and then release pressure. 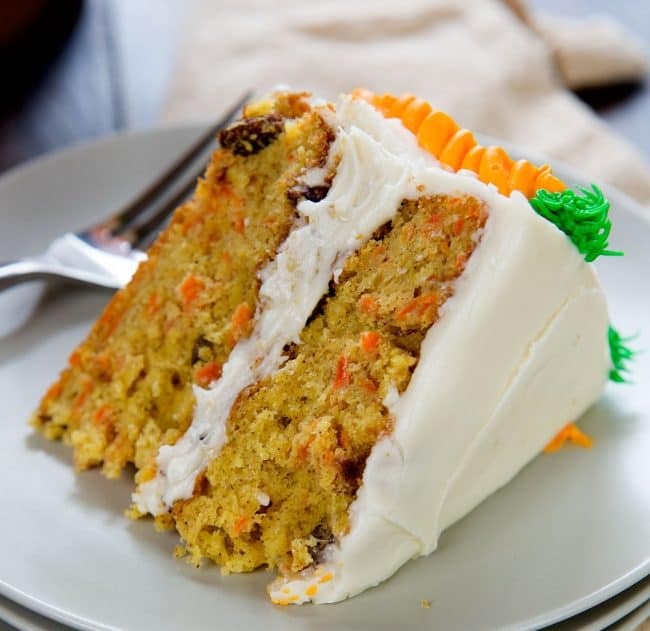 Now take your green frosting, apply pressure at the top of the carrot then put up and release quickly. Do this around the entire cake. I repeated this on top with a bigger version of the carrot. You can leave out the pineapple if you want, but I do recommend leaving it in. There is such a small amount that it does not affect flavor dramatically, but it does add moisture to this cake. Feel free to play with the seasoning a bit! I only added cinnamon, but you can also add in nutmeg, cloves, allspice, etc. 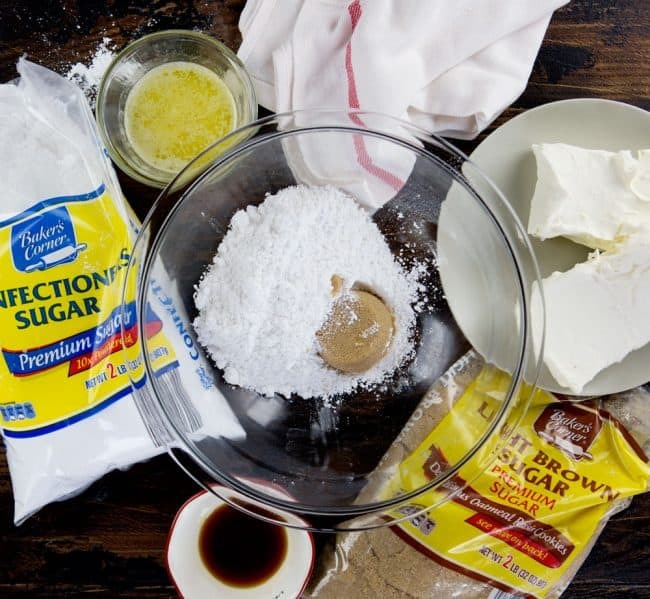 Make sure that your cake is cooled before you add the Brown Sugar Cream Cheese frosting. 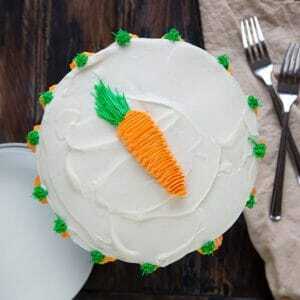 Also, make sure the cream cheese frosting is set before you add the carrot decoration. If you add the carrots too soon they may slide down a bit as the cream cheese frosting settles. 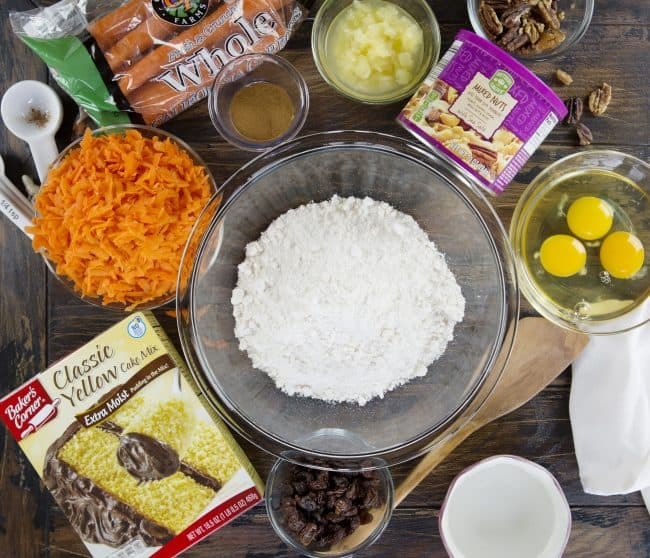 Find my 100% from-scratch Carrot Cake Recipe here. 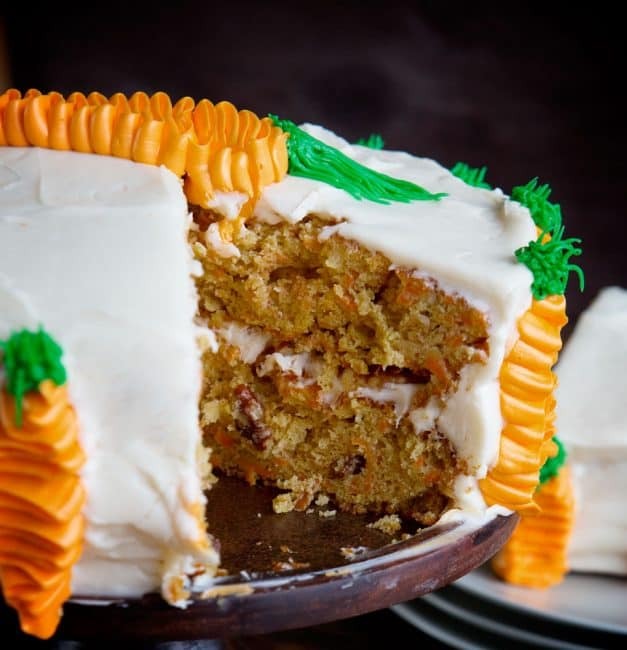 Your carrot cake is absolutely beautiful. I would love to make one. I am afraid mine will not turn out as pretty! Sorry but there is a typo. Up where you give the directions it says to cook instead of cool the cake in the pans before inverting the pans. It probably is obvious to most people but just in case. It surely looks divine! Great catch! Fixed. Thank you! This looks so delicious! I love the little accent carrots. Super cute! This looks so good!!! 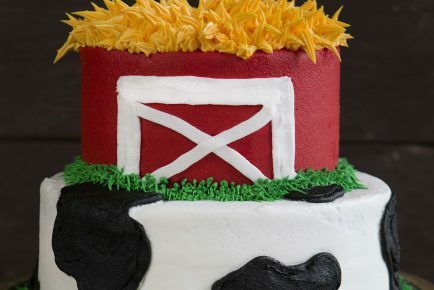 If we want to make it all from scratch – any reason to not use your yellow cake mix? 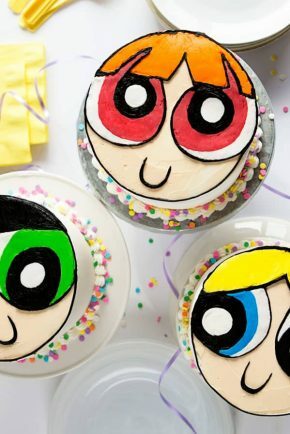 This cake looks so yummy!! Can we use your yellow cake mix instead? Thanks! I made this cake last night and I think it’s the best looking cake I’ve ever made. Everything was delicious but I think 1/2 teaspoon of salt in the cake batter can help counter the sweetness the overall cake has. Thank you for all of these cake recipes. You’re bringing out the best baker in me. God Bless! Where I live we don’t have premade cake mixes. 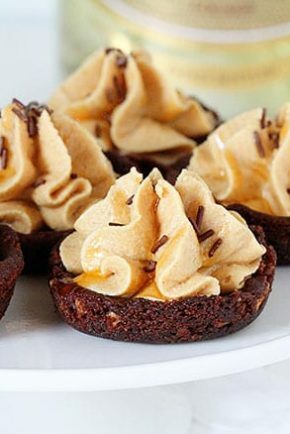 What are the ingredient that I can use to substitute the yellow cake mix? I have a receipes for a pineapple cake that always seems to fall in the middle of tgev9 x 13 pan. If I bake it longer then the cake becomes dry. HELP! I have a receipe for a pineapple cake that always seems to fall in the middle of the 9 x 13 pan. If I bake it longer then the cake becomes dry. HELP! Could i bake it in a Bundt pan? I’m guessing about an hour? Is there any adjustments I would need to make if I didn’t use pineapple?